Synthetic peptide derived from within residues 350 to the C-terminus of Human NPFF1 Receptor. This antibody gave a positive signal in the following whole cell lysates: SHSY5Y. This antibody gave a positive signal in the following cell lines: PC12. Our Abpromise guarantee covers the use of ab45350 in the following tested applications. WB Use a concentration of 2 µg/ml. Detects a band of approximately 64 kDa (predicted molecular weight: 48 kDa). Receptor for NPAF (A-18-F-amide) and NPFF (F-8-F-amide) neuropeptides, also known as morphine-modulating peptides. Can also be activated by a variety of naturally occurring or synthetic FMRF-amide like ligands. This receptor mediates its action by association with G proteins that activate a phosphatidylinositol-calcium second messenger system. 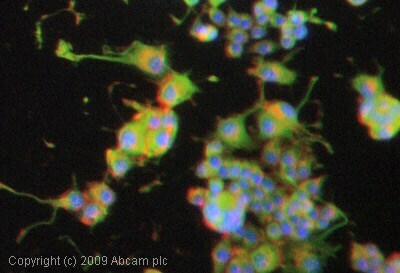 ICC/IF image of ab45350 stained PC12 cells. The cells were 100% methanol fixed (5 min) and then incubated in 1%BSA / 10% normal goat serum / 0.3M glycine in 0.1% PBS-Tween for 1h to permeabilise the cells and block non-specific protein-protein interactions. The cells were then incubated with the antibody (ab45350, 1µg/ml) overnight at +4°C. The secondary antibody (green) was Alexa Fluor® 488 goat anti-rabbit IgG (H+L) used at a 1/1000 dilution for 1h. Alexa Fluor® 594 WGA was used to label plasma membranes (red) at a 1/200 dilution for 1h. DAPI was used to stain the cell nuclei (blue) at a concentration of 1.43µM. ab45350 has not yet been referenced specifically in any publications. Publishing research using ab45350? Please let us know so that we can cite the reference in this datasheet. DISCOUNT CODE: Expiration date: I am very pleased to hear you would like to accept our offer and test ab45350 inICC/IF on mouse. This code will give you 1 free PRIMARY ANTIBODY before the expiration date. To redeem this offer, please submit an Abreview for ICC/IF on mouse and include this code in the “Additional Comments” section so we know the Abreview is for this promotion. For more information on how to submit an Abreview, please visit the site: www.abcam.com/Abreviews. Remember, we publish both positive and negative Abreviews on our datasheets so please submit the results of your tests. The code will be active once the Abreview has been submitted and can be redeemed in one of the following ways: 1) Call to place your order and mention the code to our customer service department; 2) Include the code in your fax order; 3) Place your order on the web and enter the promotional code. Any feedback that you can provide will be greatly appreciated, whether positive or negative. If you have any further questions, please do not hesitate to contact us. We look forward to receiving your Abreview and wish you luck with your research. The terms and conditions applicable to this offer can be found here: www.abcam.com/collaborationdiscount.